If you experienced the Baltic winter and have lived to tell about it, the good news is that you’ll be rewarded for your endurance with the most important Latvian holiday Jāņi. The national holiday is known as Līgo, Jāņi, or Jāņusvētki, taking place June 23rd to 24th. It’s the opportunity to experience the longest day of the year and the Midsummer celebrations. These two days are state holidays, and are the dearest to every Latvian, near and far. Like most modern-day traditions, Jāņi dates back to the pagan times, when farmers celebrated the summer solstice, the high point of summer and the turning point towards winter, which signaled the time to harvest, as opposed to tend to, the crops. In point of fact, the summer solstice can happen on any day between June 20th and 26th, but Latvians always celebrate Midsummer on the 23rd and 24th. Unlike the Christianized versions of Pagan holidays, such as Christmas and Easter, Jāņi remains unabashedly and fully Pagan. Celebrations remain quite true to the original, with only a few modern additions. For example, these still take place out in nature, revolving around plant-gathering and fire-making, but now instead of brewing your own beer and making your own cheese you can buy them at the local supermarket. If you’re planning to celebrate the holiday yourself, here’s RigaNOW!’s how-to guide, step-by-step instructions for a successful Jāņi. The event really begins on the day of the 23rd, with a trip to the local supermarket. Yes, just like in all cultures, food comes first in the celebrations. So what should you buy if you want to have a typical Latvian Jāņi celebration? Shashlik (shish-kebabs)! It’s true, this Georgian meat dish is the staple of many a Jani celebration throughout the country nowadays. Just go to the meat section and buy a big bucket of it already chopped and marinated – all you need is the skewers. After that don’t forget to pick up some Jāņusiers (Jāņi cheese). This is a special cheese from curds with caraway seeds made especially for the celebrations, although nowadays one can acquire it all year round. Aside from that you will need salad ingredients, gherkins, snack foods and plenty of beer, although if you celebrate with the locals you may have the opportunity to sample the local dark brew that is also made for this holiday. Traditionally, it was the mistress of the house that made the cheese, while the master brewed the beer. 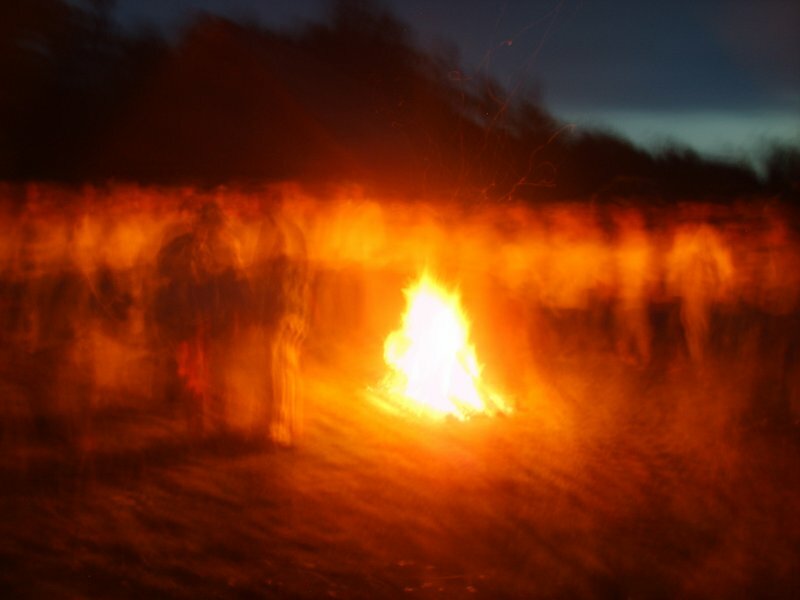 When you arrive at the place where you are to celebrate Jāņi (note: it can be anywhere, really, but it must be out in nature, either in the countryside or at the seaside), the first thing you will need to do is gather plenty of firewood for the long night. Yes, this is the longest day of the year, and the bonfire is a symbol of the long-burning sun, which is why the bonfire is lit at sunset and must be kept burning all night. Traditionally, it is the men who jump over the bonfire, but the equal rights movement has made it so that women can now jump, as well. A word to the wise: no Latvian in their right mind would jump over the bonfire when it is at its height. If you would like to try this at home, use caution, and only jump when the bonfire has gone down to a respectable size of mere flaming embers! While gathering firewood, also look out for other vegetation, namely, oak leaves and flowers. The day before Jāņi, the 23rd, is also known as “Herb Day,” and all kinds of herbs are gathered and saved for their special healing properties. Wreaths are made from the herbs and placed on all of the buildings of the farmstead, as well as on all of the livestock. Traditionally, only those named Līga and Jānis would wear garlands during the celebrations. Nowadays, everyone who wants to can partake in the fun. If you were a scout, you can probably figure out how to twist the stems to make a garland, otherwise, any true Latvian will be able to show you how. Latvia is indeed “the land that sings,” yet this is never more true than on Līgo night. Krišjāns Barons catalogued thousands of “dainas”, or national folk songs, by roaming the countryside in the late 19th century. Most Latvians know the melodies, and others are able to lead with the lyrics every year, but it’s also traditional to just make the lyrics up and even sing them to others to poke gentle fun or praise the hosts of the party. The songs are known as ligotne songs, and most of those sung on this night end with the common “līgo, līgo” refrain. Līgo literally means to sway, but also colloquially to make merry. The idea is that you līgo, or sway, into the night and through to the morning. If you don’t know the words, the melodies are simple enough and quite repetitive so as to allow you to catch on quickly. Some folk songs don’t even use words, making it easier for the foreigner to jump in and follow a ramtai ramtai radi, ridi, rīdi…ramtai rīdi rallallā….it just rolls off the tongue! Since the midsummer festival is also a festival of fertility and abundance, it will come as no surprise that traditionally this holiday has many “mating rituals” connected with it. There are countless traditions and superstitions connected with Jāņi. For example, women are supposed to throw their Līgo garlands up into the trees. Count the number of times you have to throw it to get it to stay in the branches, and that’s the number of years before you’ll get married. Another tradition states that you should put your glove under your pillow before you go to sleep (after the sun sets, remember!) and you’ll dream of the man you will marry. If an entire two days out in the wilderness is simply not for you, there are several ways to celebrate the holiday in Riga. If you’re in town on the 23rd and 24th, you’ll no doubt have the Old Town and all the beer gardens entirely to yourselves, as most Latvians make a mass-exodus from the city on the 23rd. During the weeks before the holiday there are parties and events around the city that will give you a taste of how to celebrate Jāņi, without having to leave the comforts of downtown. And on the 22nd, the day before Līgo, there will be an Herb Market in Dom Square, where you can sample Jāņi cheese, beer, and shashliks, as well as honey, fish and bread from local markets. This year the Herb Market will take place from 10.00 to 17.00, and will feature a number of musical acts by local choirs and rock groups, as well as shows of traditional Latvian folk dancing. The Outdoor Ethnographic Museum (Latvijas Etnogrāfiskajā brīvdabas muzejs) will also have its Līgo celebrations on June 22nd, during its normal working hours from 10.00 to 17.00. Here you can get the most authentic view of the way Jāņi was traditionally celebrated on the old-fashioned farmsteads of days gone by. To get to the museum (Brivibas gatve 440) take a taxi or bus number 1 from the corner of Merķeļa and Tērbatas streets (H-1) all the way out to the “Brivdabas Muzejs” stop (about a 20 minute ride). Mille merci à Vous chanteurs et chanteuses de Létonie qui avaient interprété cet Hymne.